Fig. 11. 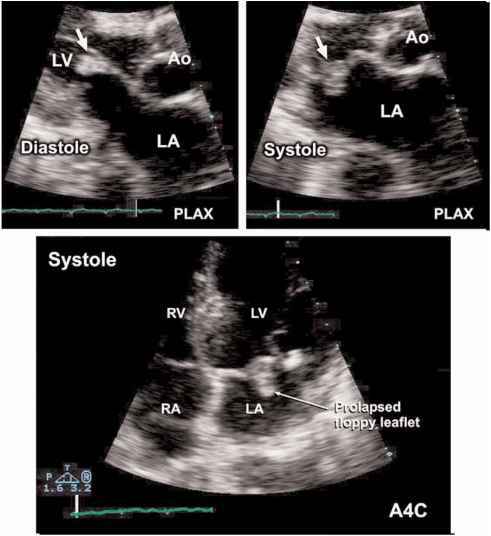 These images show a floppy "myxomatous" anterior mitral valve leaflet that prolapsed into the left atrium during systole, which can create a tumor-like appearance. Marked mitral regurgitation was present. detected incidentally, but some may cause symptoms by embolization or obstruction of cardiac inflow or output. In general, atrial tumors are more often intra-cavitary, whereas ventricular tumors are more frequently intramural (i.e., involving the myocardial layer). 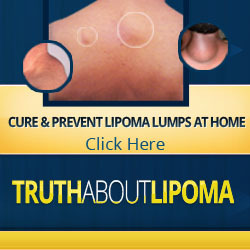 From most common to least common, a brief description of these tumors follows. Table 1 summarizes neoplastic and non-neoplastic masses that may be seen on echocardiography. In adults, cardiac myxoma is the most common cardiac tumor, accounting for 20-50% of all cases (Figs. 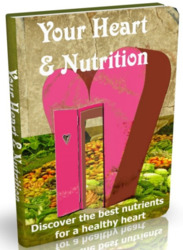 1 and 14; please see companion DVD for corresponding video for Fig. 1). There may be a female predominance, and familial syndromes with myxoma as a phenotypic trait (e.g., Carney syndrome) exist. Approximately 75% of myxomas occur in the left atrium, with the remainder largely arising within the right atrium. Cases arising from the ventricles and IVC, as well as multiple myxomas within the same atrium have also been described. The typical atrial myxoma arises from the interatrial septum near the fossa ovalis, and is often anchored via a stalk-like pedicle. Size can range from less than 1 cm to an extent that virtually fills the entire atrium. The echocardiographic appearance is typically either a compact, rounded, or ovoid mass, or, alternatively, a polypoid, papillary, friable mass. The echodensity may be homogenous or finely speckled. Myxoma can cause valvular obstruction (i.e., a functional stenosis) or may prolapse and cause regurgitation of the mitral or tricuspid valves leading to heart failure. In addition, systemic or pulmonic embolization can occur, as well as constitutional symptoms. Complete surgical excision is usually the cure. Fig. 12. 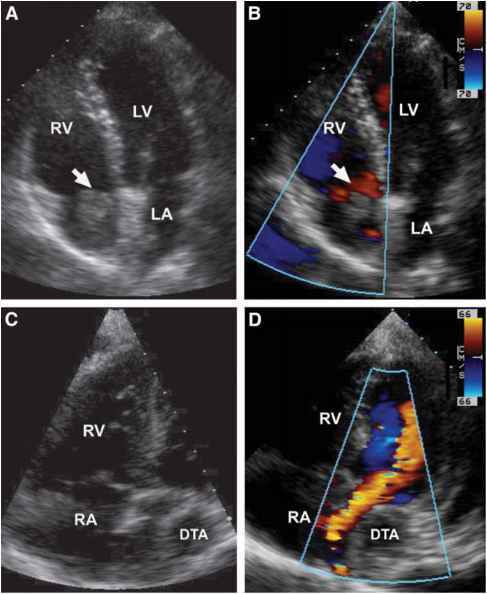 Color Doppler interrogation of the right atrial mass (arrow, A,B) in confirmed its intracardiac location. Compare this to color Doppler interrogation of the left atrium that shows extracardiac compression by the descending thoracic aorta (DTA; C,D). Papillary fibroelastomas are the next most common benign tumors, and consist primarily of dense connective tissue elements. These are found most frequently in elderly patients, and usually appear to arise from the valvular endocardium on either side of the heart. They manifest as small (<0.2-1.0 cm) mobile pedunculated echo masses which can be variably filamentous, frond-like, or oval in shape. They are characteristically attached to valve leaflets, with a predisposition mainly for the aortic valve (where they can arise from either surface), or secondly for the atrial side of mitral valves. Less frequently, they are attached to the mitral chordae or papillary muscles, or tricuspid or pulmonic valves. Because of their mobility, they are thought to be shed rather easily into the bloodstream and may cause embolic symptoms. Figure 15 shows an elongated thread-like papillary fibroelastoma on the LV outflow tract aspect of the aortic valve (please see companion DVD for corresponding video). Fig. 13. 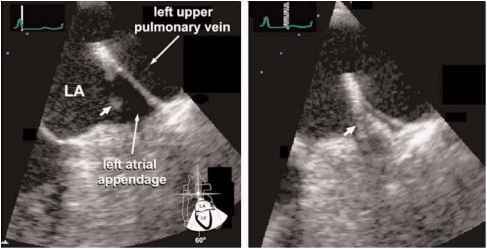 "Warfarin ridge" artifact occurs owing to acoustic shadowing (short arrows) from the hyperechoic ridge or fold of tissue separating the left atrial appendage from the left upper pulmonary vein. "Thrombi are the most common intracardiac mass. ^Myxomas are the most common benign cardiac tumors (~50%). Secondary cardiac tumors are 20-30 times more common than primary cardiac tumors. Fig. 14. 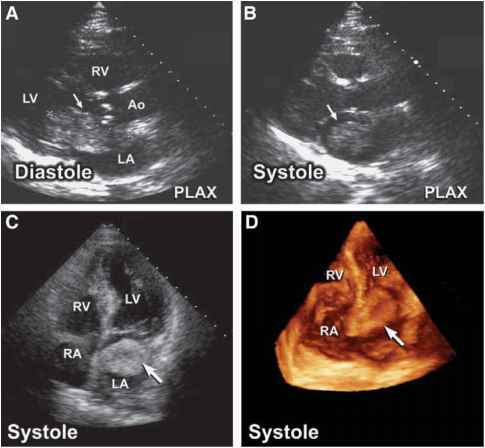 Parasternal long axis images (PLAX) show a large atrial myxoma (arrow) with characteristic heterogeneous echogenicity. It occupies much of the left atrium and prolapses during diastole (A,B). Systolic still frames showing apical four-chamber view of a left atrial myxoma (arrow) and its appearance on three-dimensional echocardiography (C,D). please see companion DVD for corresponding video). It is important to distinguish this entity from lipoma-tous hypertrophy, which is an accumulation of excess fat in the interatrial septum, sparing the fossa ovalis, giving a characteristic "dumbbell" shape to this structure (Fig. 5; please see companion DVD for corresponding video). Lipomatous interatrial septal hypertrophy is considered a normal variant of no real clinical significance, although it can become very prominent in some individuals. Pericardial cysts are benign fluid-filled tumors of the parietal pericardium, which are occasionally detected on chest X-ray and usually occur at the cardiophrenic borders. In the pediatric population, rhabdomyomas are the most common primary cardiac tumor. These tumors are rare after adolescence, and may regress in childhood. Most frequently involve the ventricle and ventricular cavity, and are often associated with tuberous sclerosis. An aid to diagnosis lies in the fact that 90% are multiple. Less common primary tumors, found predominantly in infants and children, include fibromas (rare tumors that typically occur within the septal myocardium), heman-giomas, and cysts. Approximately one-fourth of primary cardiac tumors are malignant sarcomas. The various subtypes (angiosar-comas, rhabdomyosarcomas, lymphosarcomas) have been reported at all ages. Angiosarcomas tend to occur in the right heart, and rhabdomyosarcomas can arise in more than one area of the heart. However, there are no clear distinguishing echocardiographic features; all share common characteristics of rapid invasive growth and metastasis, with frequent extension to the pericardium and a poor prognosis.